The frenetic exuberance of summer has passed to be replaced by cool and blustery mornings with a scent of burnished leaves in the air. Once again Seattleites are succumbing to sweaters and rain boots as the nights draw in, flanked on either side by an eiderdown of clouds trailing mist and drizzle in their wake. After a long summer of salads, it is time again for the slow simmered pot dishes of fall. Nothing evokes fall like a fragrant cauldron of beans, simmered in an aromatic swath onions, garlic, herbs and, most importantly, a well chosen morsel of meat. In fact, it never ceases to amaze me how a small piece of cured pork can transform a monotonous pot of beans into a succulent and satisfying meal. The Italians have known it for centuries, as have the Spanish, the Mexicans and countless other cultures. Using meat as a hidden seasoning or condiment, rather than as the star of a dish, is the at the heart of peasant cuisine—the conjuring of vast, delicious meals out of scant means. Last weekend I made one such dish, a bean soup rich with delicata squash, rosemary, and pancetta. 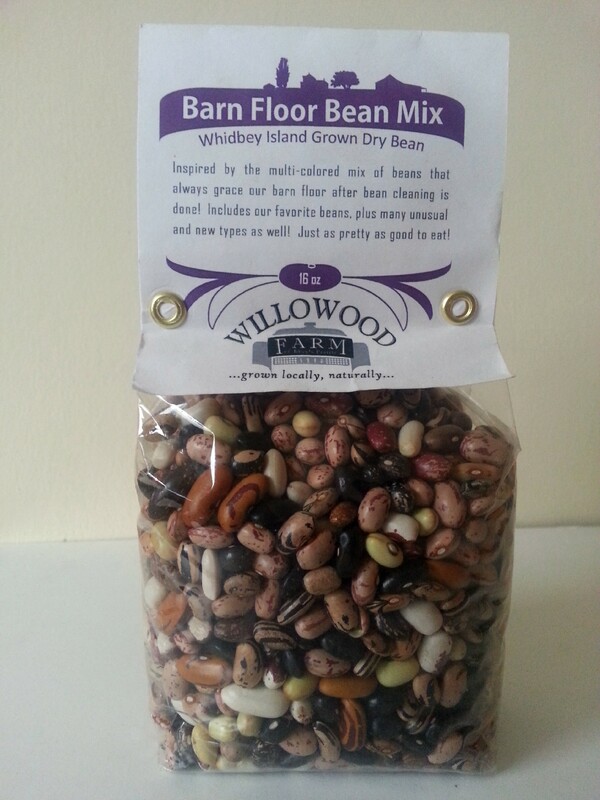 I used a mere half pound of pancetta to a pound of locally grown dried beans from Willow Wood Farms on Whidbey Island. The result was fantastic; accompanied by a hearty loaf of bread it serves six for a deliciously comforting one-pot meal. Welcome to autumn. Put beans in a pot, cover with water, and leave at least 8 hours or overnight. Drain, place in a large saucepan, and cover with water. Bring to a boil, then reduce to a simmer and cook until tender, about an hour. Drain. Heat a large, heavy-based saucepan over medium low. Coat the bottom with olive oil and butter then sweat the onion and garlic for 10 minutes or until golden and soft. Add the pancetta and cook for a few minutes. Add the rosemary and tomato paste (along with a splash of white wine if you have any to hand) and cook for a few minutes longer. Add the squash, stir, and let flavors simmer together for a few minutes. Pour in the beans, add water to just cover, and bring to the boil. Reduce to simmer and cook until squash is tender, 10-15 minutes. The soup is delicious as is, but for a creamier version blitz half the mixture in a food processor and then return to the pot. You can also use a handheld immersion blender for a few seconds for the same result. My window herb garden was a complete failure. The bench that I built, wobbly from the start, warped within weeks so that the pots of herbs it supported spewed earth all over our living room. By August, with little more than a forlorn sprig of pygmy thyme to show for my efforts, I surrendered, carrying the flowerpots to the compost heap and disassembling the bench. It was not a promising start to my gardening career. On the bright side, life has moved at warp speed over the last year: In May the Texan and I bought a house, in July we got engaged, and yesterday, we harvested our first tomatillos from the front garden. The house: a single story green house with a south facing front garden, a white trash back yard, and a bathroom that looks like a 1950s hair salon. We adore it and have endless plans for its improvement, the way one might feel towards a lovable yet unruly child. The engagement: The Texan (Josh) proposed in a little cabin in the woods on Whidbey Island. I said yes. The harvest: So far our little plot has yielded padron peppers, tomatoes, beans, tomatillos, and a smattering of herbs. We hadn’t intended to plant anything this year, given the lateness of the season and the all consuming nature of settling into a new home. And then we met the neighbors, Don and Jane. Consummate gardeners with their own farm in Carnation, they happily loaded us up with plants. “These need to go in the ground now”, Jane urged handing us a tray full of gangly tomato plants. And so we dug up the grass and the hideous shrubs and tucked in a bed of veggies. A little to my surprise, they grew. I say that ‘we’ planted the garden, but I must confess that as soon as we moved into the house, territories were drawn. Josh is the gardener and I am the cook. We may help each other out, peer into the other’s domain, but it is quite clear who commends each realm. I for one am perfectly content with the arrangement. Roasting the fruit beforehand adds sweetness and depth of flavor. Try it with a goat cheese quesadilla, huevos rancheros, or your favorite burrito—riquísimo. Preheat oven to 500F. Place the tomatillos, green chilies, jalapeños, and garlic cloves in a large roasting pan and roast for 20 minutes or until the peppers are charred and tomatillos are swimming in their own juices. Peel, stem, and seed green chilies; stem and seed jalapeños. Using a slotted spoon, scoop all veggies into a food processor along with the herbs and spices. Pulse until mixture reaches desired consistency (I like fairly smooth green salsa). Bring your water bath to a boil; meanwhile, sterilize four pint sized canning jars and lids. Pour salsa into jars with ½ inch of head space. Wipe rims with a clean, damp towel; then place lid and screw band on each jar. Place jars in water bath canner and process for 15 minutes. Let cool. 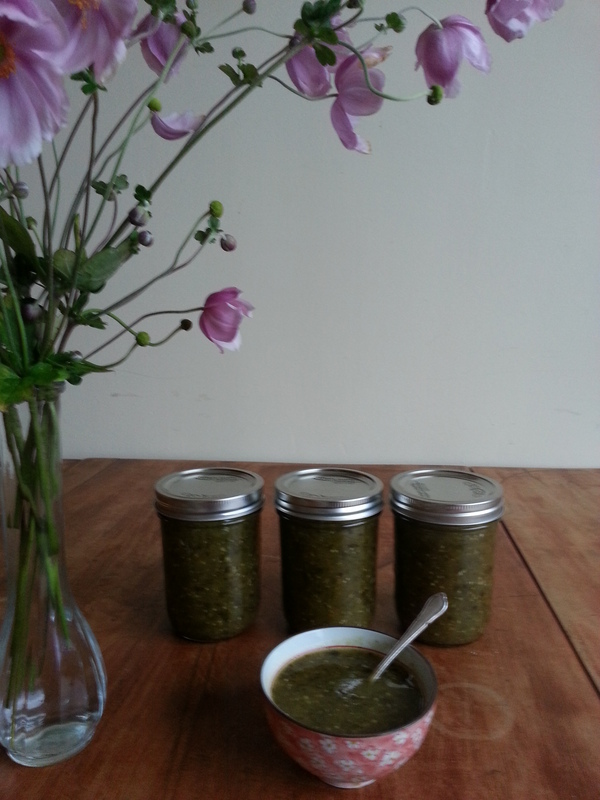 This salsa taste quite vinegary at first but mellows out in a few days.